N-Vision X200XP X200xp Thermal Eye Thermal Imaging Camera FREE SHIPPING! The N-Vision X200xp Thermal Eye is an extremely powerful thermal imaging camera. Its sensitive amorphous silicone microbolometer can detect a human at a range of up to 1500 feet, allowing law enforcement officers to perform surveillance or track fugitives with ease even in total darkness. Automatic brightness and contrast adjustments provide a consistent image despite changing light conditions, and the display is dimmable so that you can preserve your night vision. Its premium optics produce a sharp image, with no blooming from light sources. Weighing in at under a pound and sized to fit into a jacket pocket, it is highly portable, and its rugged case is built to provide a secure grip. It is waterproof in up to nine feet of water, and shockproof to six feet, making it durable enough for all-weather tactical use. 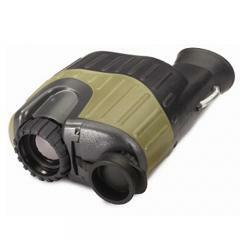 ©2002-2019 CopsPlus.com: N-Vision X200XP X200xp Thermal Eye Thermal Imaging Camera FREE SHIPPING!